Sanguis is the world’s first hand-held, portable, and inexpensive blood cell counting device. This at-home tracking could save as many as 15,000 lives every year. 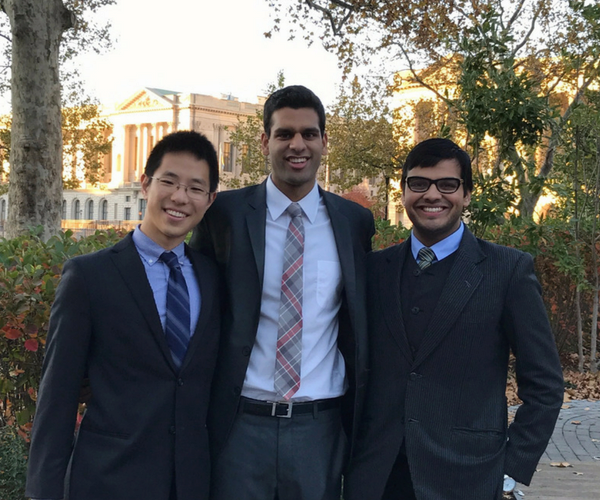 Sanguis’ three cofounders, Divyansh Agarwal, GR’23, M’23, Prateek Agarwal, M’19, and Daniel Zhang, GR’23, M’23, are also best friends. They met on day one of medical school here at Penn, and quickly realized that they share an innate curiosity about science and nature, and a drive to make the world a better place. This means that Dan is the “scientific mastermind,” Prateek brings regulatory and financial “street smarts” to the table, and Divyansh describes himself as the spokesperson, building bridges between the academic and the startup world. Sanguis is the world’s first hand-held, portable, and inexpensive blood cell counting device. It measures neutrophil levels—the body’s primary infection fighting cells. When neutrophil counts go down, the body loses its ability to fight infections. With Sanguis, patients can easily test their neutrophil levels at home, with just a few drops of blood. They can track falling levels, and contact their doctors right away. In the US alone, each year, 650,000 cancer patients receive chemotherapy in an outpatient setting, and of those, close to 400,000 will suffer from neutropenia—low neutrophil levels—during their treatment. As a result, around 15,000 people die from infections and other complications that rush in when the body is unable to defend itself, and many more must delay or reduce their much-needed chemotherapy treatments. It’s a “common problem, and a lethal problem,” explains Divayansh. “By the time we graduate, we want to have identified a problem, come up with a solution, and found a way to do something about it,” Divyansh says.